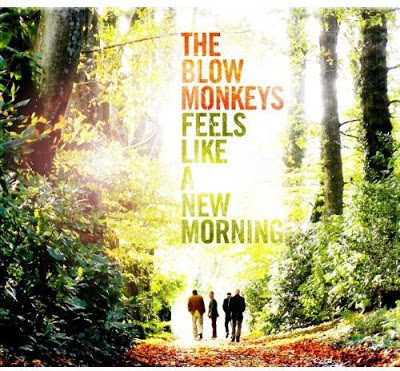 Discussions Magazine Music Blog: SPAZ reviews THE BLOW MONKEYS' Feels Like A New Morning! SPAZ reviews THE BLOW MONKEYS' Feels Like A New Morning! The Blow Monkeys of the 2000s are very much the same Blow Monkeys of the '80s, only different. Feels Like A New Morning is their third studio album since reuniting in 2007 and, to be honest, it's a far more consistent affair than anything they've released in their 30 year career. Now, don't get me wrong... I LOVE The Blow Monkeys. I got into them back when the U.S. EP Forbidden Fruit was released in 1985. I ended up buying their import debut album, Limping For A Generation (1984) and loved it's strange, cool vibe. When the slick and lush Animal Magic came out in '86, I snapped it up. "Digging Your Scene" went on to be a pretty substantial hit for the band, but apart from radio plays, it was the 'alternative' stations like KROQ who continued to play the band after that hit, not Top 40. The album She Was Only Grocer's Daughter (1987) was an even better album than Animal Magic, but here in the U.S., it didn't get as much attention. The band went in a House-flavored direction in '89 with Whoops! There Goes The Neighborhood and 1990's Springtime For The World (neither of which were released here in the States) but split soon afterwards. Frontman Dr. Robert pursued a solo career and even worked alongside Paul Weller in the '90s, but by 2007, the band came back together to try to reclaim their magic. But anyone looking for another "Digging Your Scene" were sorely disappointed. For those looking to hear some new classic Blow Monkeys tunes were, thankfully, paid in spades. Now, in 2013, the band offers up Feels Like A New Morning, an album that continues to avoid the gloss of the '80s and embraces the warm, earthy feel of the Doctor's solo albums. But this is NOT a Dr. Robert album by any means... it is a band effort that succeeds on every level. Dr. Robert's voice is deeper, richer and more expressive than the band's early work, while the rest of the Blow Monkeys - Neville Henry (saxophone), Mick Anker (bass) and Tony Kiley (drums) - leave their own individual marks on the album. "Oh My" is the album's first single and on the surface, it may seem as if it's an average, acoustic Blues inspired track, but they throw a few unexpected chord changes in the mix, lifting the track to a different level. Marc Bolan was great with taking a few standard Rock 'n' Roll chords and then adding a melodic twist by tossing in a fourth chord that changed the course of the song. The Blow Monkeys pull that off here. The soulful "Chained", with Robert's passionate vocal, sounds like a logical single and, while it doesn't sound like it came from the '80s, it might be the track that lures back their old audience that may not have been paying attention to their post-reunion recordings. It is an extremely moving track that bears repeated listenings. A real stunner and will certainly be one of the best tracks of the year. If you're looking for some upbeat tracks, then "Feels Like A New Morning" and "Shake It Off" will satisfy your cravings. For those looking for something jazzy will fall in love with "In No Time At All". The band offer up some wonderfully melodic mellow tunes with "Cover Me" and "Hold Everything Dear". And there's plenty of great songs that straddle different genres here. More Wilco than Style Council, the new sound of The Blow Monkeys is stylistically diverse and thoroughly engaging. Feels Like A New Morning will surprise those who only know the band from "Digging Your Scene" or anything else they recorded in the '80s. The Blow Monkeys prove here that they deserve your love and adulation. They make it all sound so elegant with an edge..
P.S. Be sure to pick up the 2CD version which features acoustic versions of Blow Monkeys classics!